In a Nutshell: First published in 1996, the goal of the Dartmouth Atlas of Health Care is helping Americans better understand how medical resources are distributed and applied in our country. The New Hampshire-based Dartmouth Institute for Health Policy and Clinical Practice envisioned it as a tool to assist policymakers in making sense of the rising costs of government health care spending. Its findings come from a database consisting primarily of Medicare spending on health care delivery, and access to the database is available to the public, as well as to hospitals, health care analysts, the media, and those responsible for setting health care policy. Americans have plenty to be proud of as citizens of the world’s largest economy. However, not everyone gets to enjoy the country’s prosperity. A host of disparities — from where in the US people live to how much they earn — limits an individual’s quality of life. Access to affordable health care is one of these disparities. Health care costs continue to climb at a rate that exceeds both the nation’s gross domestic product (GDP), and individual income growth. In fact, at a time when the economy struggles to maintain a 2% growth rate, the rate of spending on health care in recent years is nearly triple that. To illustrate the extent of this challenge, the US Department of Health and Human Services projects an average of 5.8% growth in health care spending annually for the coming decade. In an effort to help policymakers understand the factors surrounding the rapidly rising costs of health care delivery, researchers at the Hanover, New Hampshire-based Dartmouth Institute developed the Dartmouth Atlas of Health Care. The Dartmouth Atlas offers research-based statistics and analysis of the health care system, along with frequent disparities in the cost and efficiency of health care services. It also provides data on Medicare usage and reimbursements that are broken down according to geographic regions, individual hospitals, and types of treatment. When the Affordable Care Act (ACA) was being designed and debated in Congress in 2009, Dartmouth Atlas research was an influential part of the process. Costs and benefits taken from the team’s research findings allowed lawmakers to base their decisions about the future of the health care system on facts and actual data rather than opinion. Data that’s collected and published by the Dartmouth Atlas team also helps other researchers and groups in performing their own studies. By making available all of the information collected and analyzed by the researchers at Dartmouth Atlas, other groups can focus their attention on specific policy proposals rather than duplicating efforts. Health care spending that outpaces the growth rate of the economy is an especially large problem for our government. That’s because the government, through Medicare and Medicaid, accounts for nearly half of all health care spending in our country. Since 1996, Dartmouth Atlas has used Medicare data, in addition to data from Blue Cross and other sources, to provide detailed information and analysis on variations in utilization and spending across different populations and regions of our country. To understand just how the Dartmouth Atlas measures and tracks health care spending using Medicare data, it helps to know how the Medicare and Medicaid systems work. Medicare is the federal health insurance program covering people aged 65 and over, certain people with disabilities, and anyone with kidney failure requiring dialysis. Medicaid is a joint state and federal program that provides health coverage for low-income individuals. The Centers for Medicare and Medicaid Services (CMS) is the federal agency that collects data on every patient and provider using these federal health insurance programs. This data is made available for research purposes in a national claims database that can be accessed and studied. The Dartmouth Atlas is one of the most comprehensive collections of this data available. Since the implementation of the ACA in 2010, more Americans are insured and have access to health care than at any time in our nation’s history. While this is a positive development in ensuring better and more widely available care, it’s also had the effect of driving up health care costs. That’s because people who are insured are more likely to seek medical attention when needed. This higher demand for care has led to higher utilization of medical services, and therefore higher overall costs. Health care costs vary wildly by region, and one of the goals of the Dartmouth Atlas is making sense of this. Medicare is the primary source for health care coverage and insurance under the ACA in many states. As a result, increases in the cost of health care delivery have been borne commensurately by the Medicare system. But, costs aren’t rising universally in all regions. In fact, the cost increases vary between some regions by as much as 18%. The Dartmouth Atlas team is committed to identifying exactly why these disparities exist. The Dartmouth Atlas of Health Care was first published in 1996, with a goal of better understanding how medical resources are distributed and applied in our nation. John E. “Jack” Wennberg was founder of the Center for Evaluative Clinical Services at Dartmouth Medical School, and is the driving force behind the creation of the Dartmouth Atlas Project. In 2009, as Congress was debating the ACA, many Democrats turned to research done by John and another researcher at the Dartmouth Atlas, Dr. Elliott S. Fisher. Using the data gathered and assessed by these two influential researchers and the rest of the team at Dartmouth Atlas, Congress was able to enact complex legislation that was foundational for implementing the Affordable Care Act. The stated goal of the Dartmouth Atlas Project has been to improve our understanding of the causes and consequences of inconsistencies in the way health care is delivered around the country. In support of this goal, the team’s researchers formulated a series of questions that were intended to improve health care delivery. If they could use the data available to answer these important questions, they could provide science-based evidence to policymakers. 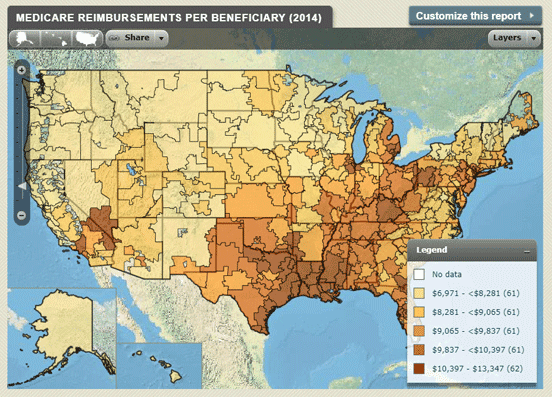 Regions where Medicare spends more have more poor people. Does poverty explain the differences in spending? Do more expensive regions and hospitals have sicker patients? Is there any evidence that spending more on health care leads to better outcomes? Understanding the answers to these and other questions from Dartmouth researchers is crucial in furthering the ongoing health care debate. The implications are already being translated into practice, with the goal to advance the science of health care delivery. As our country continues the debate over how best to offer affordable health care to more Americans, the work being done at Dartmouth Atlas is a valuable part of this effort. Only through science-based and evidence-driven study can we be assured of providing the best care possible to everyone who needs it.